We build incredibly creative, interactive learning experiences for parents, educators, administrators, and professionals. Indoors or out, large group or small, we specialize in deconstructing complex thinking and relationships to help you set your thinking in motion. ​Scroll down to get inspired by the Thinkshops below or let us custom-design one for your learning community. 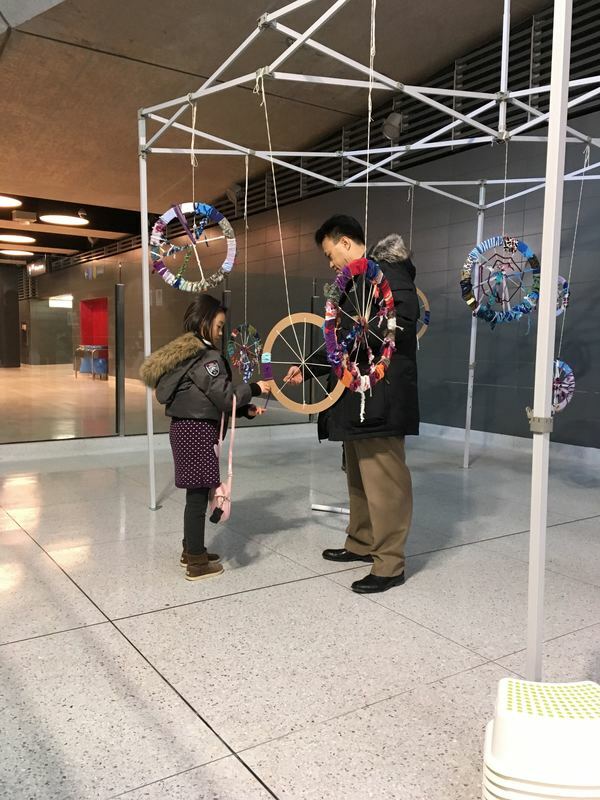 This was our first Thinkshop since taking a break to focus on our research project at KOLTS Seneca Lab School – and it was delightful to come back to playing with new ideas and developing new experiences for this wonderful group of educators. We looked closely at the relationships between materials, people and ideas, and decoded the inherent properties and learning potential of simple, everyday materials. We were thrilled to be invited to co-facilitate this 2-day professional learning experience in the forest alongside inspiring educators, Fran DeFilippis and Louise Jupp. There is nothing like being immersed in nature for (re)connecting with your emotional, spiritual, and intellectual senses! Experiences included shelter building, Thinkined's Dialogue with Nature, an exploration of David Sobel’s Design Principles and Play Motifs, an inspired reading of "Everybody Needs a Rock" by Byrd Baylor and Peter Parnall, and more. And of course, some of our most memorable moments came during our interactions with Blu Waters – Seneca's Elder on campus and Cree/Métis Elder of the Mi'Maq Wolf Clan. Blu led the children of Seneca's KOLTS Forest School in a beautiful tree dressing ceremony and shared insight into the Seven Grandfather/Grandmother teachings, leaving us all with a great deal to reflect upon. >> If you are interested in joining the next cohort in the forest, please let us know. Embracing loose parts in toddler spaces can be extremely challenging! To really understand the power of materials and adapt them safely for very young children, we need to consider their properties and limitations in the context of child development. So we created this Thinkshop to look closely at the language of materials – to understand and interpret the learning that emerges when very young children encounter loose materials. We love to participate in this seasonal conference for educators in Simcoe County! For the winter session, we decided to look closely at tools and the role they play in outdoor learning. We invited participants to consider the inherent value of simple materials and why they're so essential to inquiry learning outdoors. We expanded and refined our own definitions of tools so that, as educators, when we're looking for a child's definition, it will bring us one step closer to making their learning visible. An introductory Thinkshop on the wisdom of materials, the inquiry process, authentic outcomes, relationship building, common language, and creating space for unpredictable, spontaneous inquiry. We came away inspired by this cohesive, enthusiastic group of early years educators who created their own drinking game and chose to extend our chat session to soak up every ounce of knowledge they could wrap their heads around. LOVED IT! This banquet space offered us fabric-draped walls and multiple ways to control/dim the lights. So we built a Thinkshop that focused on reflecting in both the literal and figurative sense. Responding to a space when designing a learning environment creates a seamless backdrop for authentic learning and discovery. We explored the image of the learner, seamlessness, purposeful ownership, perspective, roles and identities, rights and responsibilities and more. It is always amazing to witness the depth of engagement and the wide range of approaches and creations that emerge when people are given time and space for open-ended, inquiry learning. An indoor/outdoor Thinkshop designed with multiple layers of learning, including: how we test the limitations of our learning environments, how we see and understand the world, reciprocal relationships with people and nature, self regulation, contrasts, nature’s signs and data, documentation, the power of materials, and the culture of community. We designed this Thinkshop to unravel the complexities of relationship-building – to align with the conference's inquiry on maximizing relationships. 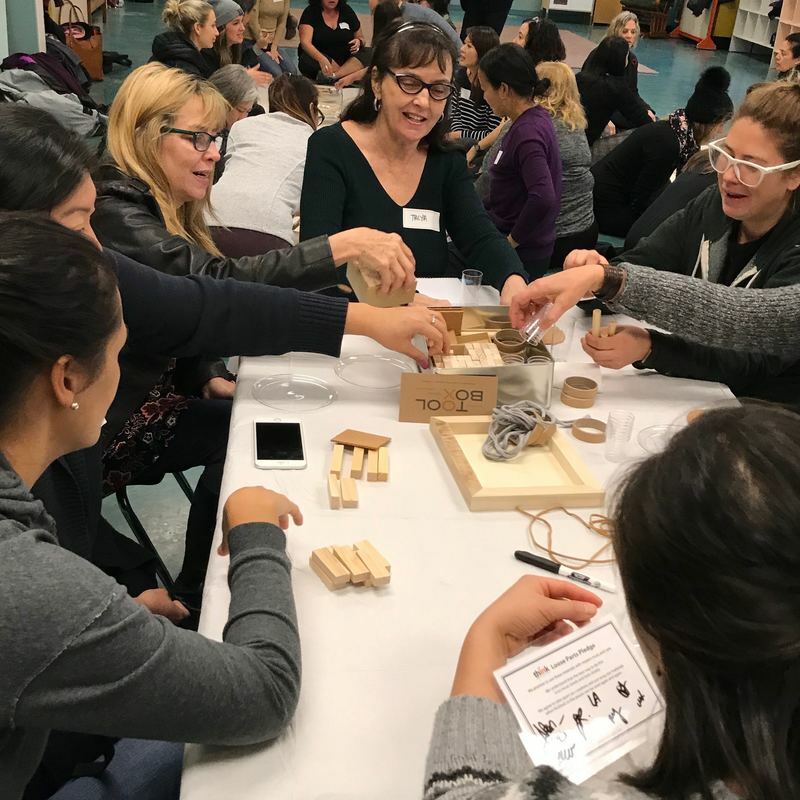 We invited early years educators to consider the power of loose parts to engage learners, inspire creative thinking, and ultimately build community. What emerged was a joyful (re)discovery of working with our hands, and the power of open-ended, simple materials. We looked closely at the conflicting definitions embedded in the word 'relationship' and considered the tensions that exist between freedom and limitations. What happens when we give a group of educators time and space to play with yarn? When we pull too tightly or let go? When we open our minds, remove competition? Take ownership, release ownership? This was a captivating day of professional learning for educators from across five counties. Beginning with our signature loose parts picnic, participants discovered the power of loose parts to maximize creative thinking and encourage self-directed learning and engagement. With the four foundations of Ontario’s Pedagogy for the Early Years as our guide, we pulled together the pieces of the cultures, needs and limitations of our own unique learning spaces with a culminating community-building experience. In this experiential Thinkshop, we looked closely at ways to set the stage for spontaneous, self-directed learning. Participants were invited to interact with curated collections of materials from three of our exhibits – to unleash their own creative thinking about self-directed learning and discover the inherent joy of leaving room for spontaneous inquiry. In our constantly evolving educational landscape, play in nature is gaining traction as an essential element of inquiry learning. Forest schools, No-Mow-Zones, Forest Fridays, and other outdoor learning initiatives, are popping up in schools across the world. For SCDSB’s annual educators conference, we invited participants to reframe nature – to consider why we are compelled to head outside; what we can learn in, with, and from nature; and what happens when we look closely at the design and engineering of our natural world. We designed this inspiring Thinkshop to look closely at the components of healthy learning environments, and discover the power of loose parts to encourage child-led learning in transitional, multi-age settings where sensory and mental health needs are at a premium. Participants played, interacted, and deepened their connection to community through the captivating experiences of Firebuilding and Storybuilding. An excellent introduction to loose parts and a wonderful way to bridge theory and practice. 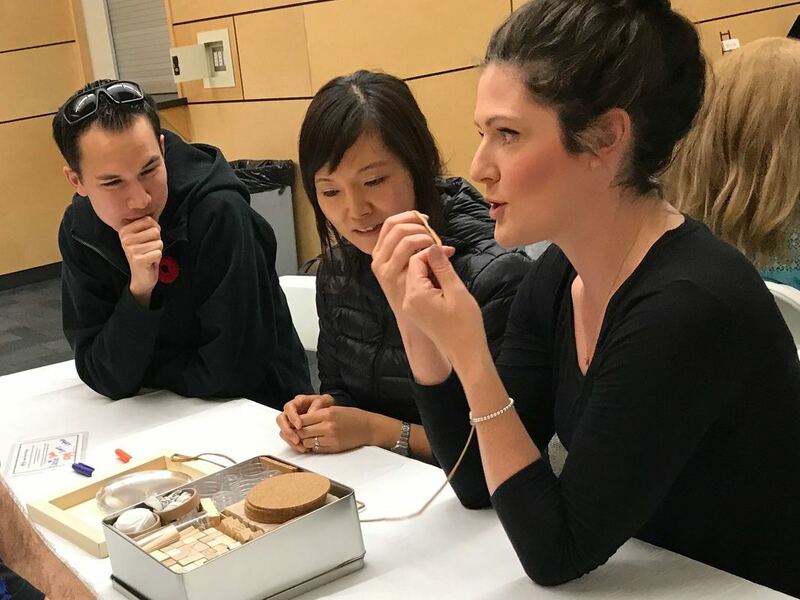 At the Joy of Childhood conference, Early Childhood Educators were invited to examine the unexpected moments that emerged from our wildly successful labschool environments where we work with children of multiple ages and skill levels. Participants played with loose parts to unleash their creative thinking about self-directed learning. The conversation and experience allowed these educators to discover the inherent joy of leaving room for spontaneous inquiries. 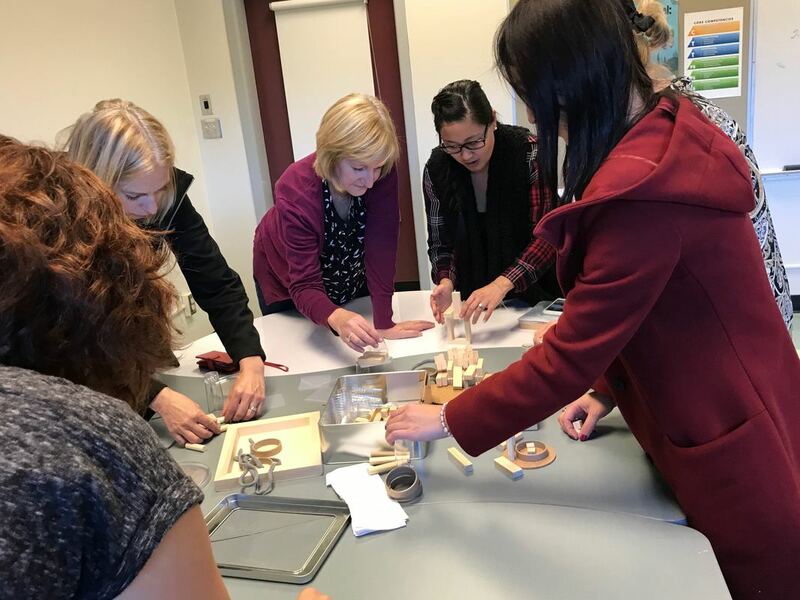 A small group of Early Childhood Educators joined us for a series of creative opportunities to look closely at our pedagogy and practice. This journey was inspired by the Art of Play interactive pop-up exhibit that brought together educators and families to explore the inter-relationship between art, play, and nature. In this intimate revisit, we delved deeper into the design elements of Line, Perspective, Colour, Sound, Nature, and our personal favourite, Remix! We spent the weekend at the Community Living Kwartha Lakes' 6th Annual "It's Child's Play and it Matters" Conference in beautiful Haliburton – setting the stage for purposeful creative expression and sharing the systems we use to build healthy learning environments. In the evening, conference attendees toured our signature Loose-Parts Picnic. The following day we ran a full-day Thinkshop where we explored the power of loose parts for engaging and inspiring creative thinking. Alongside 25 educators, we delved into the concepts of time, space, and purposeful ownership. We were deeply moved by the individual and collective investment in learning that emerged.